Europe When Is The Best Time to Go to Florence, Italy? If you’re planning a trip to Florence, you’re probably wondering when is be the best time to go. After all, you don’t want to arrive there when it’s cold and raining, if you were hoping to spend your time lingering outside at the sidewalk cafes. So here’s a guide to when it’s the best time to visit Florence! A lot of tourists choose summer (June-August) for their vacation trip to Florence, and if you have to plan around school vacation schedules, you might not have much leeway in this choice. If your time is more flexible, though, there are some downsides to summer that you’ll want to consider. Weather-wise this time of year can be hot (up in the 90s Fahrenheit), and it often gets quite humid in Florence, too. 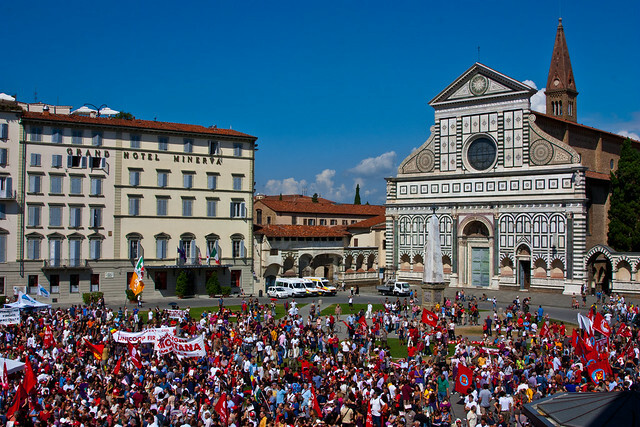 Florence is also the most crowded with tourists in the summer. So if you love hot weather, and don’t mind crowds, going to Florence in the summer may be right for you. Autumn (September-October) is a very pleasant time to visit Florence. There are less crowds than in the summer, and the weather isn’t too cold (think 68F in mid-October). Autumn is a great time to see the deciduous trees turning color, so if you love nature’s different seasons and fall color, then autumn may be one of the best times for you to visit Florence. If you’re interested in wine and plan to tour the Chianti wine area around Florence, you might be able to see some harvesting in the fall, too. Winter (November-February) can be chilly. It’s often rainy, and there is an occasional chance of snow (unlikely but possible). Winter temperatures average about 50F in January. If you’re mostly interested in indoor pursuits, however, you’ll find the museums nicely uncrowded this time of year – a world of difference from the summertime! Because there are so few tourists, you’ll also get to feel a bit more of the real local scene, rather than finding all the streets and restaurants crowded with international vacationers. Spring (March-May) is a lovely season to visit. The weather is nice, but not too hot – averaging around 70F in April. Quite a few other people are catching on to the spring option, so the tourists are starting to arrive, though it won’t be quite as crowded as it is in summer. It’s a good time if you want to see flowers blooming, perhaps taking a stroll in the Boboli Garden. One of the most important tips for any tourist is to do your research in advance, and decide what attractions are on your must see list. Then you can check the website for those attractions. Find out the schedule for your “must see sights”, and make sure whether they are closed at some times of year. It’s possible for museums or restaurants to close down in January, or over Christmas, Easter, or other major holidays. By identifying the places most important to you, you can make sure you don’t run into this disappointment. Spending Christmas in Italy could be a memorable and wonderful vacation, indeed! Just make sure you know what will or won’t be open for you before you book the tickets. If you want to venture out of town a bit, there are also some very cool festivals in smaller towns near Florence, like the Infiorata (Flower Festival) in Pienza. – Is a particular festival very important to you? If so, plan around that. – Are you tied to a particular season for school or work schedule reasons? If not, use the season overviews above to narrow down to an approximate window. – Fine tune your trip dates based on knowing any closure dates for attractions you really care about, and any less important festivals that would be fun to see. Of course, if you’re visiting other cities on the same Italian vacation, then you’ll want to do the same kind of process for them, so you can optimize all the locations you’ll visit. And now, you’re ready to start planning your trip to Florence, Italy!